Did this a year ago 32×40 Acrylic on canvas. Light through trees in Morris Park. Compare this (and the two above) with 381, and I think it shows where I’ve been going with this. Zombie Capitalism! Fake blood and tatters, march, City Hall to South Street—I cut off for home at 5th & South—up Passyunk. 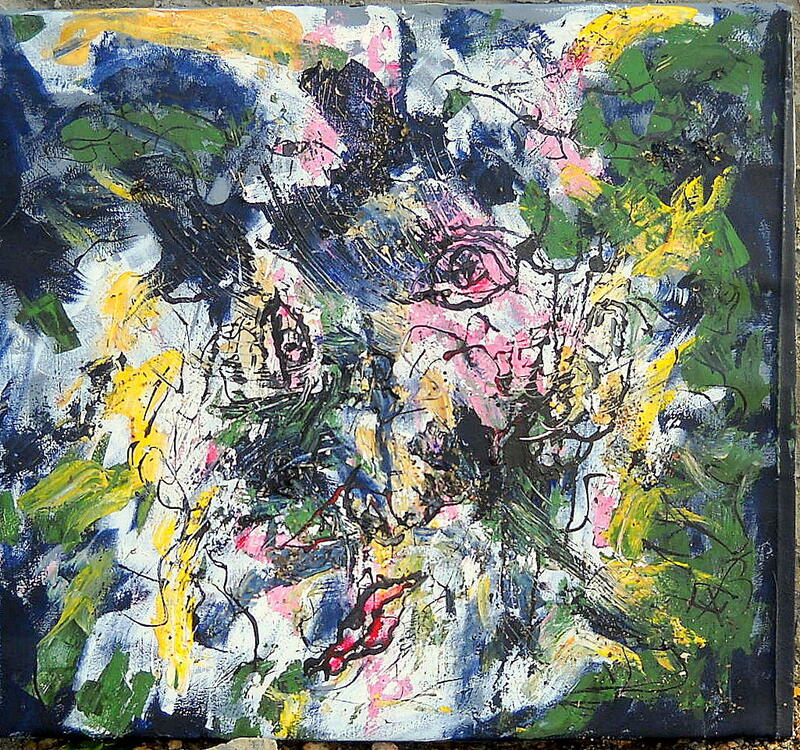 Self Portrait 29×32 acrylic on canvas with street dirt. I found this canvas in the trash, probably an art school painting. Poorly stretched… badly warped. I restretched it. Painted over it. A color scheme I saw in a dream last night. My day off – 3 ½ hours standing in sleet, snow & rain—walking back from Temple with 17… of those who came to the “Silent-No-More” vigil. Clinton was to be on campus, but canceled cause of weather. Ache all over. Facilitation tent blew down. Tents sagging under wet snow—wind predicted for tonight. Haven’t heard how Scott Olsen is doing—fractured skull from rubber bullet [Oakland]. 1:20 PM At Hidden River reading—have 5 Songs of Occupation now—have to be back for a process meeting (City Hall) by 3:00—likely six hours outside to end of GA. Dressed for that, so overdressed here. Bright crisp normal autumn day. Thursday GA—Difficult. Assaulted by a Lone Ranger. Last night—pouring rain, in Friend’s Meeting House—much better. Tonight—our Occupy Together meeting. Information & development pouring in faster than can assimilate it. Meeting at COSI—Friend’s Center closed. Union. Will close my Citizen’s Bank account as soon as rent & Comcast checks clear, and I can restore my SKYPE number. [A sandwich board sign in front of TruMark with a Guy Fawks mask, and invitation to join]. Angela Davis will be speaking at Temple & Dilworth today. I haven’t had a whole day off from OP since before the 6th. all in common – refuse! Adam in the garden of desire! #380 Graffitied: No Gods No Bosses No Leaders!